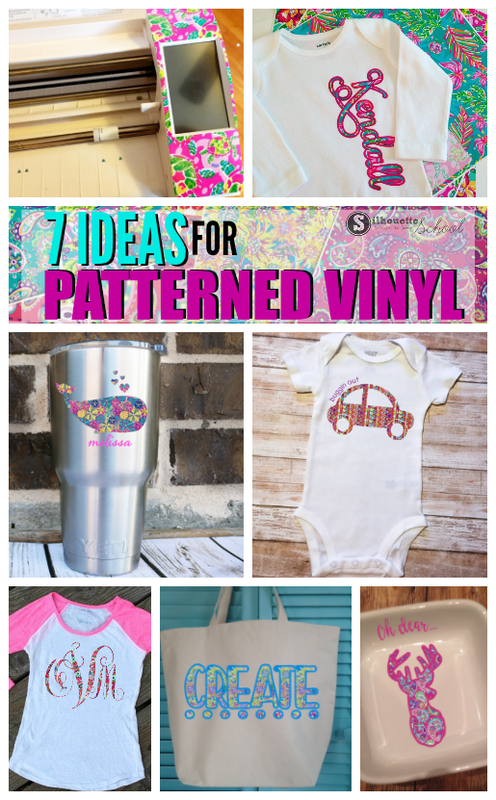 I get questions all.the.time about where to find patterned vinyl and patterned heat transfer vinyl. Until recently I was kinda left fumbling like..there's some polka dot vinyl here and chevron htv there...but if you want something more (that's legal to sell, unique, high quality, won't fade, bleed or get you in copyright trouble) the options are few and far between. Then I found Sparkle Berry Ink and I swear it was like Mandy - the owner - was there singing to me "A Whole New World." 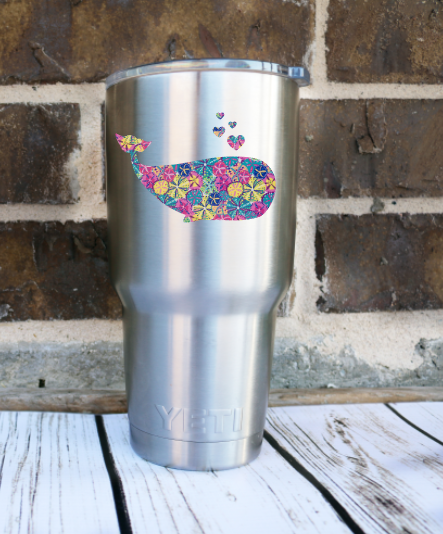 Okay so here's the deal...the Sparkle Berry Ink patterned vinyl and heat transfer vinyl are one of my new favorite things - and there's gotta be something for everyone! The pretty colorful patterns range from floral vinyl prints to aztec inspired patterned to paisleys and more. One thing I like to do is pair a patterned vinyl or heat transfer vinyl with a coordinating solid. I think that really makes both pop. It also helps define the shape of the decal. For example with this design, you can see I cut the Sparkle Berry HTV, but then I used a series of offsets in Silhouette Studio to create a border with a coordinating solid htv. This is similar to the popular fabric and htv method...only easier. Another thing I like to do is pull the patterned designs into Silhouette Studio. This lets me make mock ups so I can see how my design will look on a patterned vinyl before I cut it. After you get your patterned vinyl or heat transfer vinyl in hand, take a picture of it. Email the picture to yourself and download onto your computer. 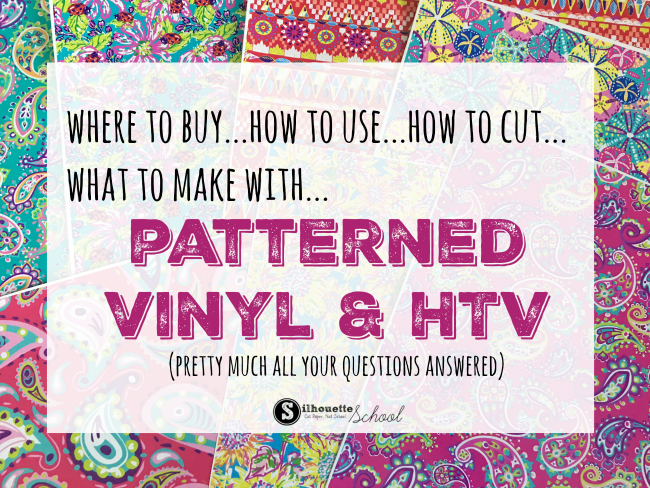 I like to re-name the patterns in Studio so I can remember which are HTV and which are vinyl patterns. 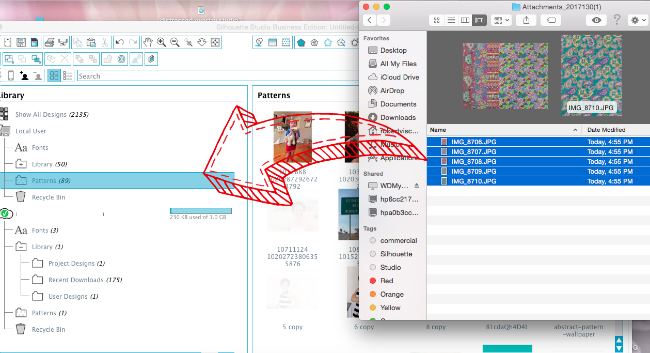 Now create your mock up in Silhouette Studio- a process I've talked about extensively on Silhouette School. For example, here's a baby onesie. I added the design first. 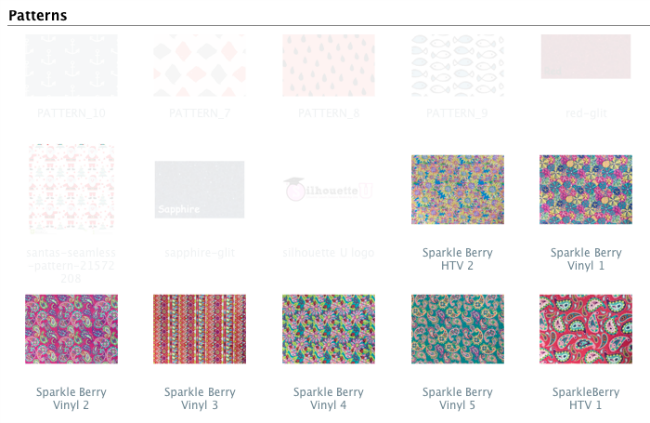 Then from the My Patterns folder, I can pick the Sparkle Berry pattern to fill the shape. I am able to easily see which direction I prefer the pattern - in this case vertical or horizontal. Once I know what my design will look like, I'm ready to cut! Would you believe all of these are mock ups?! I just love that I can use the actual pattern of the vinyl in the mock up so I really know what it's going to look like before committing. 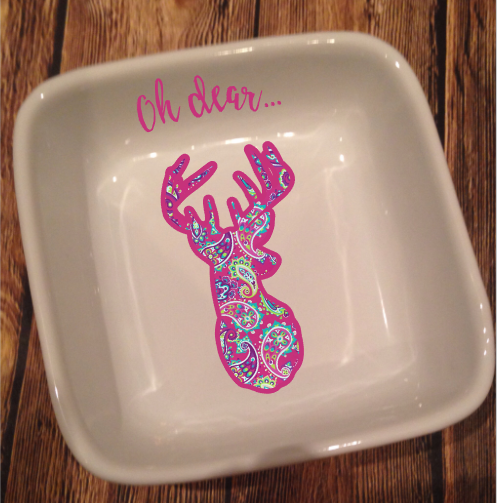 By the way - when you cut the Sparkle Berry heat transfer vinyl, you do not have to mirror and you want to cut with the patterned side up. Then...use the clear transfer sheet that's included with all Sparkle Berry HTV orders to remove the HTV from the backing and transfer the design onto the surface before applying with heat. Personally I think patterned vinyl and HTV always pop more when they have a solid color outline...but that's just a personal preference! Tried and tried to do this fabric HTV method with a name like in the example, but I couldn't get the internal off set to be solid. Could you please do a video on how to do this? The Sparkle Berry HTV does not have to be mirrored, but if I do a Siser glitter outline for my SB patterned vinyl, I would have to mirror the glitter outline--right? Help, I'm a newbie when it comes to layering. 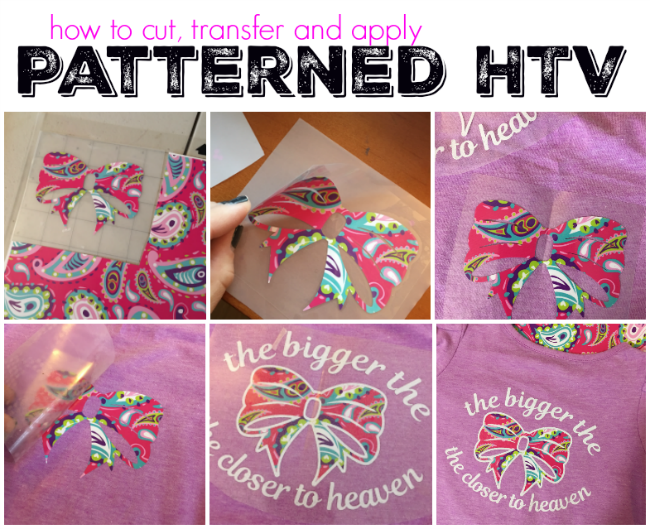 Do you have to allow for shrinkage of the patterned HTV when applying a glitter HTV outline? is there a way to print your own patterned htv? Where is the tutorial you mention for doing two colors with HTV and an iron? I cant find it anywhere! This was an awesome tutorial! 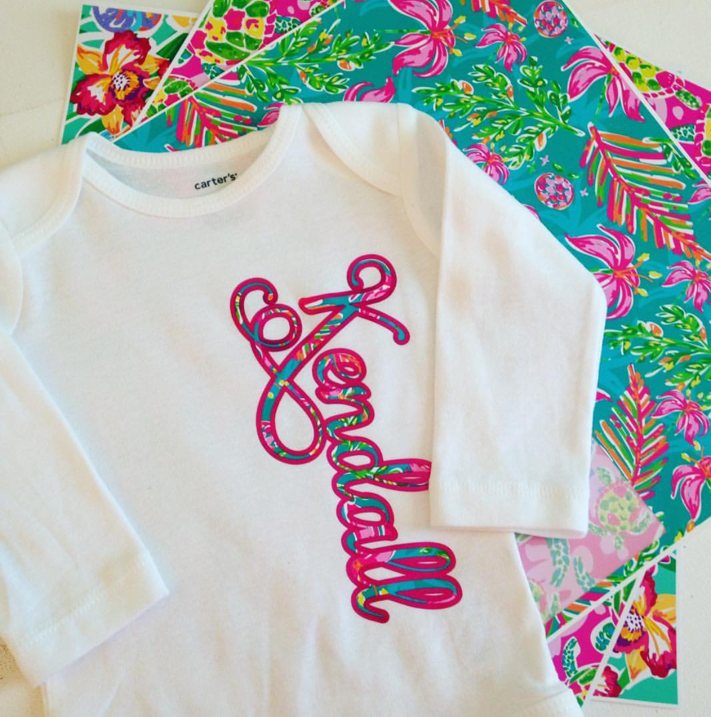 Would you mind telling me the font that you used for the Kendall shirt? Thanks again! I have the same 4 pack of vinyl that's in your kendall tshirt pic, but mine doesnt say its HTV, which I thought I was buying. and It doesnt look like HTV am I missing something.